Susie, Your vase this week is absolutely beautiful. Wow! Very kind of you John. Thanks. 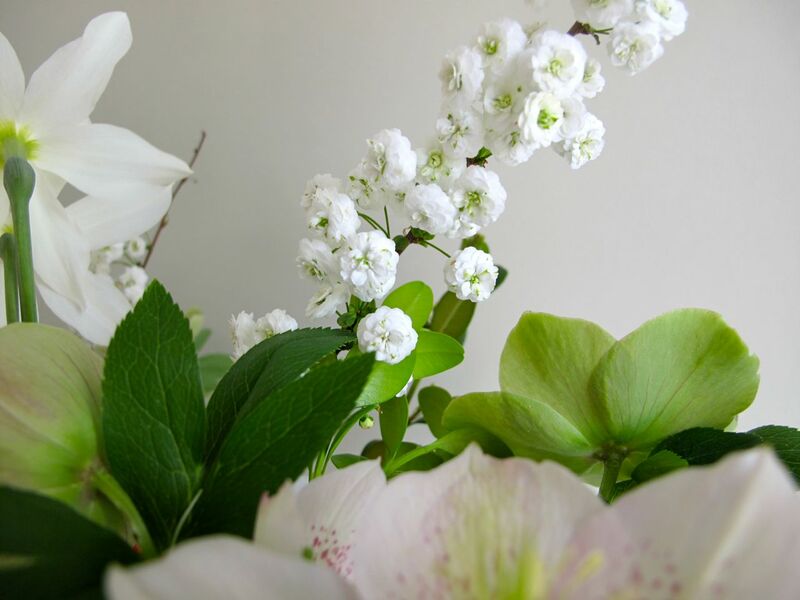 I love the mix and I especially love Thalia for its white flower and scent. Mine won’t bloom for another month. I would say the camellias look like a focal point, but that changes depending on the view. No matter the view though it is gorgeous. Thanks Donna. So you have Thalia to look forward to. I had begun to think I’d lost mine and was so happy when they opened. 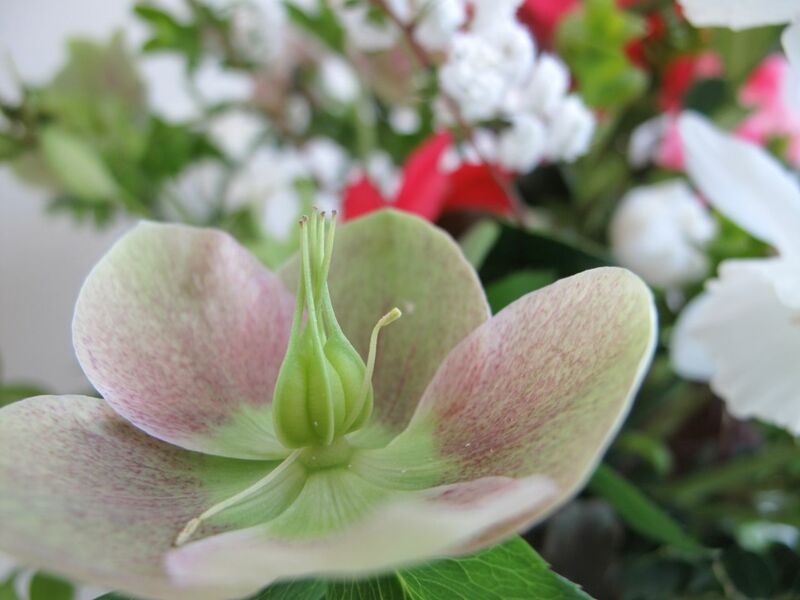 Another beautiful offering…and to think…from your beautiful garden. Thank you. I’m so happy to see the garden bright and cheerful again. This one is really exceptional! A lovely combination of colors. Every time I see your post on Camellia, I wish I could grow them in my garden too. Thanks so much Pris! 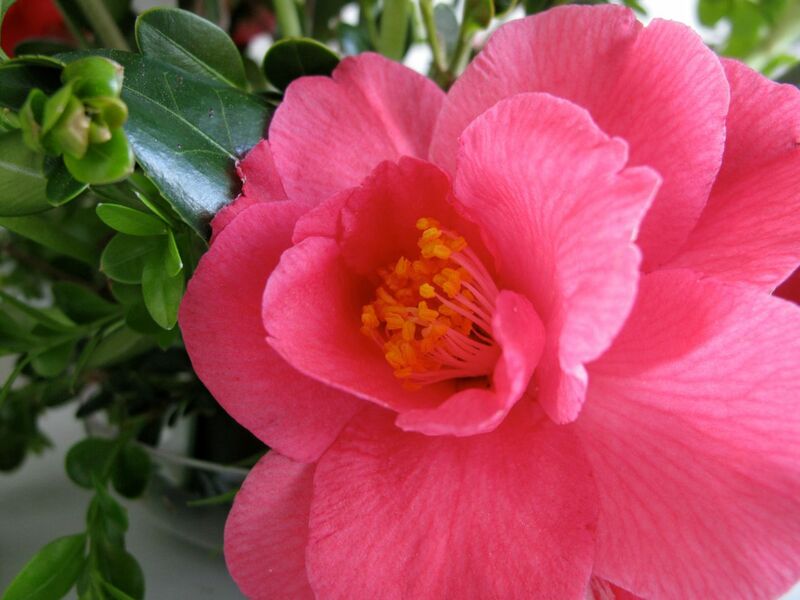 The camellias are not at their best–even here it’s borderline for growing them. We had a night in the twenties a couple of weeks ago that damaged a lot of them, but the newer buds are finally opening. Hope spring is coming your way soon. Cathy, thanks for these encouraging words. I really am pleased with this one. The garden is picking up. 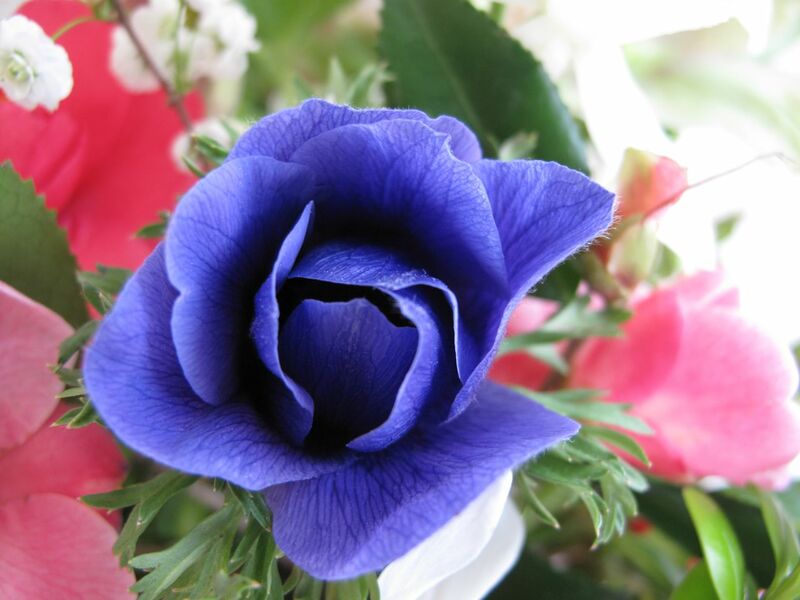 I can see the blue and white anemones from my upstairs window–they are my favorites right now. 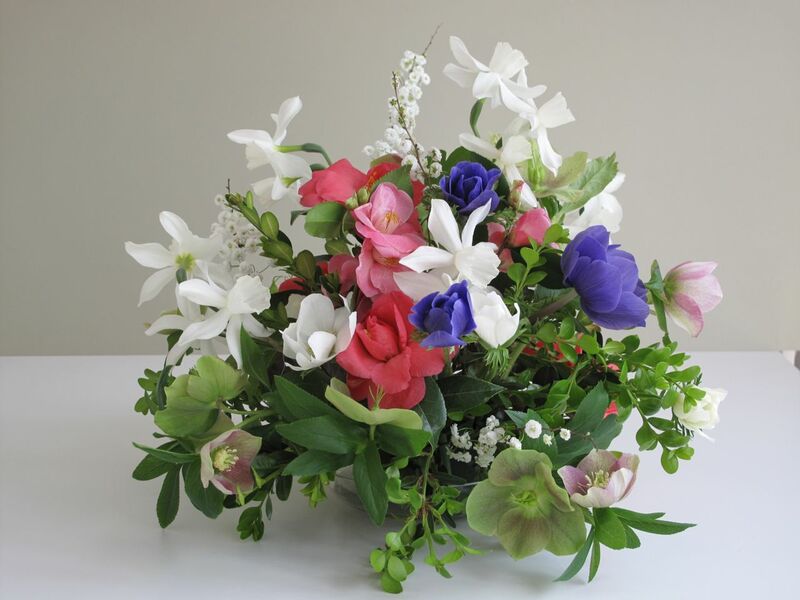 A beautiful arrangement of lovely flowers! Narcissus Thalia are only just opening here, this is one of my favourite narcissus, I can’t bear to cut mine! Thalia may be my favorite Narcissus too Pauline. I was reluctant to pick mine also, but in the end I was glad I did. A lovely colour combination. I love your anemones and Narcissus Thalia is one of my favourites. It is such a delicate shape. 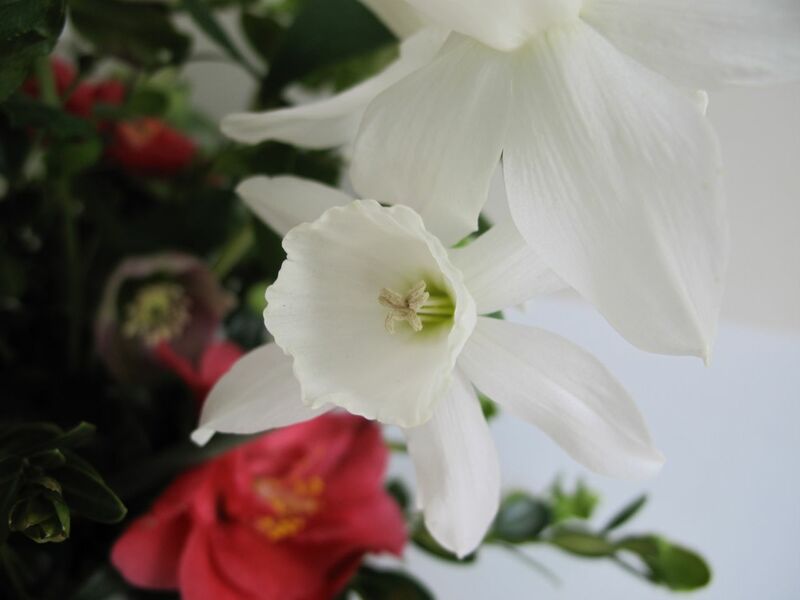 You are always very critical of your own arrangements; I think it is stunning. Oh, but I’m a friendly critic Liz, just offering some constructive criticism! Thanks for your positive feedback. Thalia does have a nice shape, very graceful. I agree with the others regarding your self criticism, although it is nice to hear as it helps me understand the technique behind your beautiful arrangement. It is wonderful to suddenly have this abundance of flowers isn’t it? Mr Fokker is a beauty, I love it in a vase and in the garden. Christina, it’s true every time I photograph the Monday vase the images help me see the design differently than when I’m just standing in front of it. I should then go back and do the necessary tweaking but rarely do. I expected to find only a couple of stems for this vase and was excited so many things were available this week. Have a good week. I adore Thalia. I had a lovely sweep in my previous garden, but am afraid I don’t have enough light here. The arrangement is lovely. I wonder if a blue and white vase would have brought out ‘Mr. Fokker’ a bit more? I can imagine your sweep of Thalia was lovely Marian. I’ve seen pictures of it used as a “river” with long stretches of Thalia in the center surrounded by blue banks of muscari on either side. Thanks for the tip about the vase color–that’s a great suggestion and it will be quick to test out. The color of the anemone recedes and I don’t have enough of them to compensate for that. That’s it Cathy–we’re all learning. And I am so glad you started sharing Monday vases because I doubt I would be practicing as much otherwise. I heartily recommend Thalia. I thought it wasn’t in the Peter Nyssen catalogue, nut I was looking in the wrong place! Thanks Judy. It screams spring, but my husband and I noticed this morning it’s spring with a little unplanned nod to 4th of July. 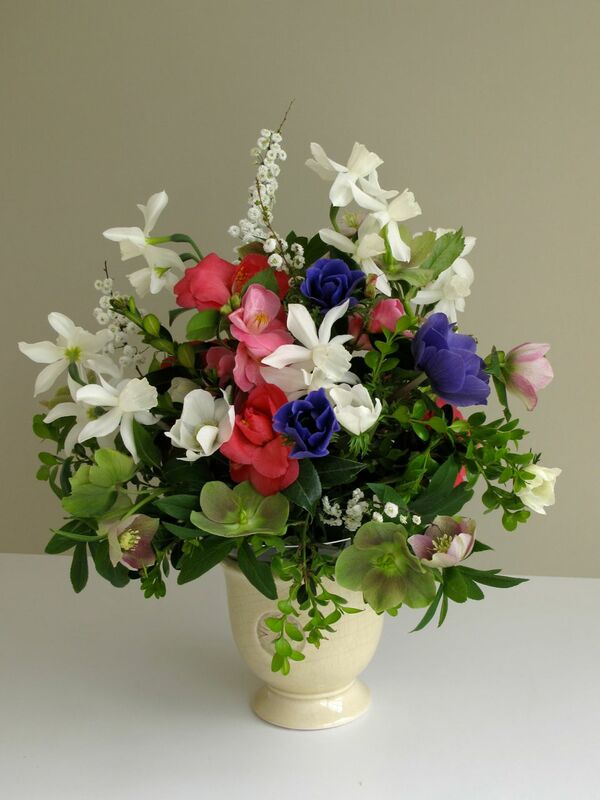 Lovely arrangement and what a clever idea to place a shallow container on top of the vase to add needed height. Anemones are one of my favourite flowers, especially blue or red ones, but I don’t have a lot of success growing them here. My Thalia are still tight buds, but something to look forward to. Using the shallow dish means the stems don’t have to be terribly long, which is helpful. I can understand why anemones would be a favorite. I just came across a burgundy one in a bulb catalog today and am so tempted. Hope you Thalia perform well for you this year. 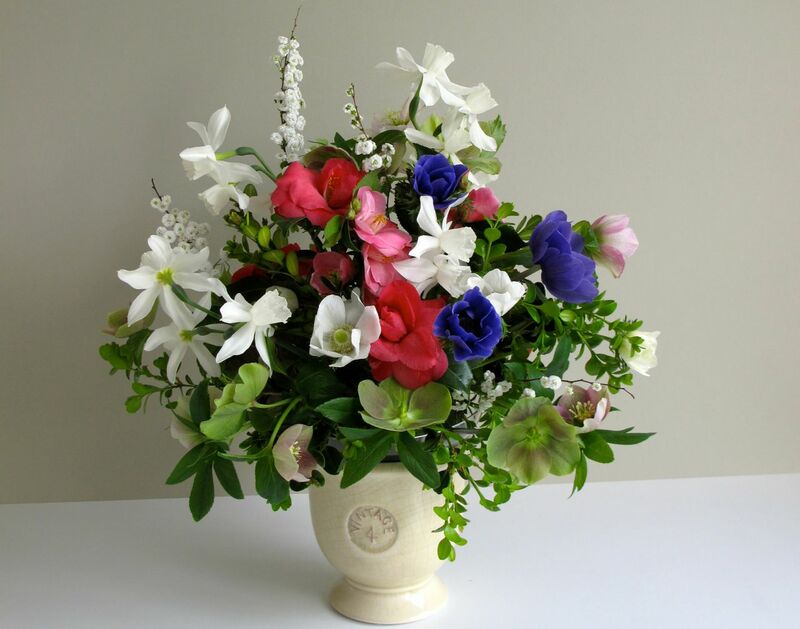 Lovely vase, Susie, with so many beautiful flowers! 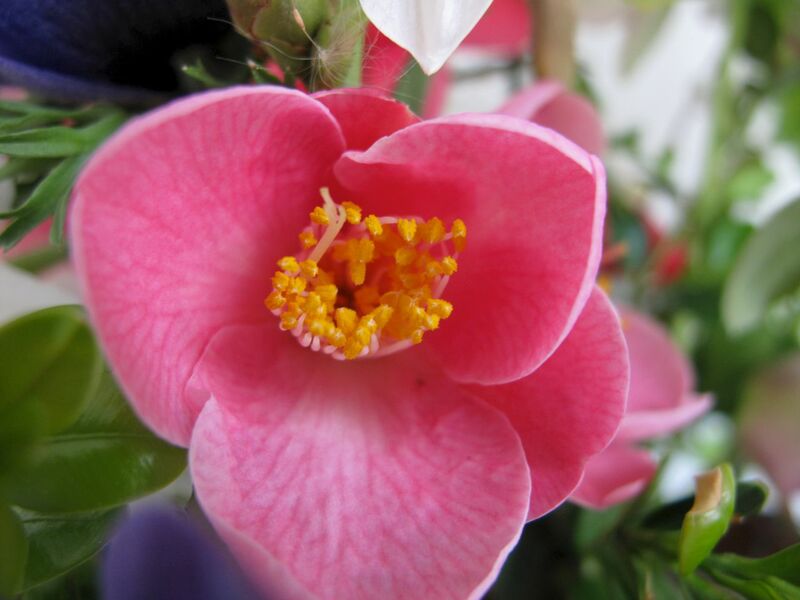 I am impressed with all these flowers blooming in your garden at this time of the year!Thanks for sharing! Thanks Anca! The garden is full of surprises this time of year. Hi Kris, thanks for the nice comment. The anemones have made me smile. This is the first year I’ve had any success with them. It must be hard to manage the garden with your unusual heat for this time of year and severe drought. Last year the Coral Delight Camellia was completely ruined by a cold snap so it’s nice to see it doing ok this year.